They do, sort of, at least if you have Humax boxes. Get a wifi bridge adaptor powered by usb. That's what I do. The rear usb port of the Humax boxes (I got it working on a DTR T1000 and a DTR T2120) have power output so all I did was buy a vonets 300mini wifi to Lan adaptor, plugged into the usb port to provide power, configured to my existing wifi and plugged a short network lead from the DTR LAN socket to the adaptor. Works a treat and fast enough for streaming HD. The tricky bit is configuring the adaptor, which I had to do plugged into my PC first so that the router wifi would communicate with it. Yes indeed, and I can confirm I ran my T1000 that way in Spain, with a similar device to yours, but made by TP-Link. However, I am but a retail user, and those with a BT subscription and a BT Home Hub will need to be aware that the Hub does not pass multicast over WiFi. For which the two alternate solutions are either to use a third-party router with no such restriction, or to get another WiFi nanorouter, plug that into an Ethernet port on the Home Hub, and talk to that from the remote WiFi nanorouter. @Roy but how about the BT Smart hub 2 with the inbuilt disc. The mesh network generated by the discs should pass multicast (one for the future possibly ). The smart hubs can pass multicast but they need to be allowed to do it. I can’t say I have a bad wifi signal in the house but once in a while I get minor wifi dropouts for a good few seconds. I have the Home Hub 4 and still use the old white Openreach modem. I don’t have UHD(4K) but don’t think my BT wifi could cope with a UHD(4K) TV channel. My wifi can cope with HD fine and works with Amazon Prime and Netflix but multicast TV maybe a different matter. So I can see why the BT Youview boxes don’t support wifi. In my living room I got the BT 2100 Youview box connected via TP Link 300mbps pass though Home Plugs and upstairs I got the retail BT Youview box connected direct into the Home Hub 4 using Ethernet cable. BT multicast channels seems to work 98% of the time without any problems using the TP Limg Home Plugs. Im not sure how the wifi disc will work with the new BT smart Hub 2. For the 3% of broadband users in the UK who have FTTP (or whatever low percentage it is, and dramatically lower if you restrict it to BT customers), this new product, launched just a few days ago, sounds like just the job. Or might be, once the links on this page can do better than this, and inform us properly. And are you saying there is a configuration setting on the current Smart Hubs that would let them pass multicast over WiFi? If so, can you please post details? No Roy, there is no configuration setting on the current Smart Hubs that would let them pass multicast reliably or to any degree of accuracy over WiFi. Even your own solution of connecting a Wi-Fi bridge to the actual Hub can prove dodgy at times and often is. @roy, I have had a homehub sent out to me to trial Wi-fi (also included a Wi-Fi AP in the pack for the youview box obviously) this was a couple of years ago, so I can confirm this can be done. Unfortunately the hub was preset when sent to me so I don’t know what the settings were. My testing proved it worked fine BUT my box was only a few meters from the hub anyway so not much of a test. I know others further away did have some issues hence it was never used as was. Not sure why you say people need fttp, it is available to the 95% that can get fttc. The reason BT hold the discs is because going forwards BT want a role in your house driving all the iot presumed to multiply very quickly over the next few years and they are hoping their role will be to look after all these including coming to your house to make sure you are setup and working and looking after them as you go forwards (yes I know what people will say about that but they do have to look for avenues to leverage additional money and the people on here are a smallish minority that know what they want but there is a vast population that don’t really have a clue). Forgetting all the noise above, what I am saying is the new SmartHub2 and disc combo create a proprietary mesh network between them, if this is capable of passing multicast (no reason why not) with a fast and secure connection there is no reason why you can't put a disc next to your YouView box add a AP to the Ethernet port of your box and voila decent wifi access. In the future you could see a disc type system built into a new box to work seamlessly with the router (very much like SKY Q does) or a disc with a direct Ethernet Access Port (don't think the discs do at the minute but not seen one). The link I gave (still) has the Smart Hub 2, if you look further down the page. I’m not sure what it would mean for a router to have a disc ‘built in’, since the disc is a WiFi repeater, and the router WiFi signal is the thing it repeats. But here’s some more information, showing what one of the discs looks like. And incidentally confirming that it has a single Ethernet port on it. BT’s information is still a moving target, and I should have given a screenshot, not that second link, as last night it led to a ‘work in progress’ page, whereas now there is content there; last night, it was impossible to find out what ‘Complete WiFi’ was, or what the broadband requirements for it were. Even now, its still not joined up; this link currently says £65, but click through the ‘Buy Now’ link and it currently says £100. (I’m saying ‘currently’, as one or other will likely get amended by the time you look at this). As to why the discs belong to BT rather than to you, your explanation makes perfect sense, except that it then requires an explanation of why BT don’t include the Smart Hub 2 in their side of things also, but do allow you to buy that? And separating the issue of whether the earlier Smart Hub can support multicast over WiFi, that BT sent you a Hub to trial this is encouraging, even if the results sent them back to the drawing board, or to abandon the attempt altogether. But even if it looked exactly like the standard Hub, the internals may have been rather different; circuit boards, firmware, and so on. So that BT can provide a Hub that can attempt to do this does not in any way support the assertion that an existing standard Hub can be reconfigured to do it, which is what we were talking about. @Roy - I would be amazed if the internals were different but I agree the firmware could well of been. I wasn't saying that people with existing Hubs could suddenly change something and make them pass multicast (although it could be possible), I was simply saying that it was possible from a Hub (albeit one that might have been slightly different) and therefore I would expect the new hub to have this built in otherwise it would be fairly 'un-futureproofed' especially as BT have already proved it can be done (albeit not very well back then but that was a few years ago). This is where I show my ignorance. Would the Ethernet LAN port allow you connect a client device i.e. STB or is that port only for direct connection to a router (WAN? ), would the client get an address ok via the disc Ethernet port?. The main thing we need to know is if multicast can be carried over the disc mesh network straight out the box, I have asked someone and will see if I get an answer (I have a SmartHub 2 but unfortunately not got my hands on one of the discs yet so can't just try it myself - I have been told that in testing a lot of people that had a 3 disc Whole Home Wi-Fi replaced that with a smarthub2 and one disc and got better speed and coverage than the 3 disc whole home solution but I haven't been able to confirm that myself so it does appear at least slightly hopeful at this point). I am not certain of the ins and outs but I know there is a split in the SmartHub 2's menu between 2.4/5 and discs wireless, so although they all use the same ssid's and allow you to roam between devices seamlessly I think there is possibly a difference between the Wi-Fi signal output from the router and the 'mesh' network the disks use (even though in use it would appear no different). Which 'could' mean that you could possibly utilise multicast using the disc network and direct connection of the STB to a disc even if you can't direct from the router wireless, I don't really know. BT has confirmed that the 2.4GHz band on their SH2 can deliver a peak WiFi speed of 289Mbps, while the same band for their Wi-Fi Discs will do 385Mbps. The Smart Hub 2’s chipset is also based on Broadcom’s 63138, 4366 and 43602 (i.e. slightly newer than the original SH1). P.S - just thought I can test one part of this out tonight by plugging my AP into my STB and connecting to the SmartHub2 and seeing if it passes the IP channels, if this does work I expect it to be quite poor as before but I wouldn't be surprised if BT locked multicast to the Wi-Fi mesh network and therefore needed you to buy BT Plus if you wanted to use your STB wirelessly (including maybe releasing a combined disc/wireless box in the future that could be sold with a BT Plus bundle). The TP-Link nano router I have has its own SSID, and possibly password also; it starts with the router SSID, but then adds something of its own. This can be faintly annoying, and inconvenient, when trying to use it as a WiFi extender, as you need to link to that amended SSID to get the benefit of it. But you still get an IP address on the main network, via DHCP. Clearly, this is not the way to go; but if the nano router broadcasts the same SSID as the main router, then while it makes the connection seamless, you now don’t know, if you are in range of both, which one you are connected to, and you may be connected to the marginal one. So for this to work, both the router and the repeaters need to know what is going on. Then you can be handed off to the most favourable device in the configuration. And this is what mesh networks do; plus, in addition, having the possibility to go though an intermediate repeater if there is more than one repeater in the network. So you can have a repeater which is out of range of the main router, and yet still go via it, as long as both it and the main router are in range of the intermediate repeater. As with all new technologies it seems, there is yet no interoperability standard for repeaters of different makes; hence BT’s lock-in via its discs. But standards will come, as they came to 3D glasses (remember those?) and to PLAs. I’ve just implemented these for my garden office, which do repeat the main router SSID on the WiFi side. But I don’t know if or how they negotiate for clashes with the main router; maybe they take the view that if you are using Powerlines, you must be out of WiFi range of the main router, though this isn’t quite true in my case. But I can see from the connected devices I have there that they are avoiding the one-bar signal from the main router in favour of the three-bar signal from the PLA, so something is going on there to ensure this works as it should. The BT discs, as with any mesh network, negotiate with the main router by DHCP, and this does not differentiate between the WiFi links to that disc and the one Ethernet link, the signal over which also goes back by WiFi over the mesh network to the main router. But whether the Smart Hub 2 passes multicast over WiFi to WiFi devices, directly and/or via the discs, or only to Ethernet-connected devices on the discs, or not at all and you still need PLAs from the main router to a YouView box if you don’t/can’t connect it directly by Ethernet to the main router, is the £65 (or is it £100?) question. Perhaps, if we can’t find the answer in the published material, some kind soul with a BT TV subscription would like to ask this, either of BT directly, or over on the BT TV forum? 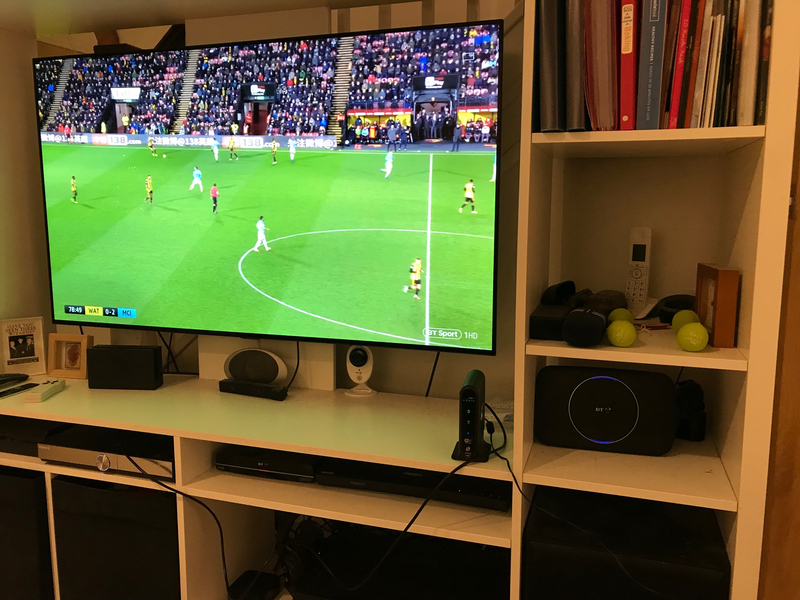 So just did some quick testing myself and I can confirm with a drt2000 connected to an arris access point and wifi connection to my smarthub2 I can sit and watch the bt sport 1 hd channel without issue. As you can see from the picture (apologies for the poor picture but was trying to get everything in) the access point is right next to router so this isnt testing the range but just first wanted to confirm multicast worked at all. Might try and connect my T4000 up to the uhd tv upstairs and see how well I can stream the 4k channel. Read the responses above which are BT centric. I'm Talktalk and have their modem attached to a Linksys Velop tri-band mesh system was wi-fi is fast 70meg download. My house is old and PLA are only ok (three rooms), my sky sports and iplayer are poor. Sky with pixels (multicast) and iplayer watching goes flaky after 30mins or so. My apple tv, firesticks and googlechrome cast all works perfectly. Therefore looking to connect to the youview box via enternet which has an input from a wifi receiver. Roy what do i need to give it a try? One of these would be a good start, and might be all you need, as IIRC, TalkTalk don’t have BT’s prohibition on multicast going out over WiFi. Especially with the mesh system you have. This nanorouter is dual band, so you can try the more empty, and potentially faster, 5Ghz band on it, if the router and mesh systems support that. 2.4Ghz has better penetration through walls and over distance, if you get issues, but hopefully the mesh system will deal with such range issues anyway. From the details on the page I reference, Client Mode seems to be the Mode you want. There might be a setting or two needed for multicast, if you have any TalkTalk Boosts, e.g. IGMP Snooping, but try it on, say, the BBC iPlayer first, for basic proof of concept, and then see if you can get the Boosts, configuring it for that if required. Think there's a bit of point missing here. Every streaming device on the market from now £15 boxes to fire sticks is wi fi enabled. BT have not released a new box in years as I've I've sald before are no longer promoting bt tv which will be irrelevant any when full fat now TV hits youview later on this year. And how many of these devices use multicast? As to full fat NowTV, I’m sure anyone who wants this has long ago bought a NowTV box or stick, rather than waiting for it to appear on their YouView box. Like me; who, looking at the channels on NowTV versus those on BT TV, and not seeing too much of an overlap, will be puzzled by your assertion that BT TV will become irrelevant? Is that just your personal opinion, or do you have any evidence to back it up? I just used an old wifi TP-LINk extender (now I have the Mesh Velop I had spares) that had an Ethernet out. I reset it then connected to my new Network. I then set it up near one of my Velop nodes and plugged it into my Humax Youview box ethernet , replacing my PLA Ethernet connection. Result! My Sky sports is working much better - no pixel issues, the iPlayer is not stopping after 30 mins. Even watched iPlayer and recorded Sky sport (multicast) at same time. They have already stated that their 4K live sport will have HDR later this year and if you really think they won’t have a new box to also take advantage you are plain wrong. Also why do you think they need to up thier game. They are the first recordable stb to have Netflix, Amazon and shortly full NowTV suite along with 4K sports with Dolby Atmos and exclusive AMC channel. They will never get into the content business like SKY but then when you have thier full content on your box along with the very deep pocketed Netflix and Amazon’s why would you want to. I have also proved you can connect a new disc to a box and get full Wi-fi so again I think BT (like or loath the idea) will look to leverage you buying thier complete Wi-fi solution to easily have Wi-fi boxes. Show me one link that shows development of a box to replace the near decade old youview box. Since the current box was launched their has been 5 new routers brought to market. And you enabling wi fi on the current box proves what exactly?? That the new smart hub enables multicast over Wi-fi. Hi Scott .youview was launched in 2012 which was 7 years ago. A decade is 10 years. 10 minus 7 is 3. Like I sald "nearly " a decade old device. If your "facts" differ then I will stand corrected. Hi Scott. Its interesting that back in 2015 bt considered 4k more of a development to the T200 then wireless. Like it or not' not having a wi fi box in 2019 is unacceptable. How many customers have bt lost be because their router is in another room from their TV? Many people use PLA’s or as Roy has said if you really want Wi-fi you can get it. BT trialled Wi-fi solutions but couldn’t get a reliable connection for multicast, that will only change with a mesh network that complete Wi-fi will offer so watch this space this year.